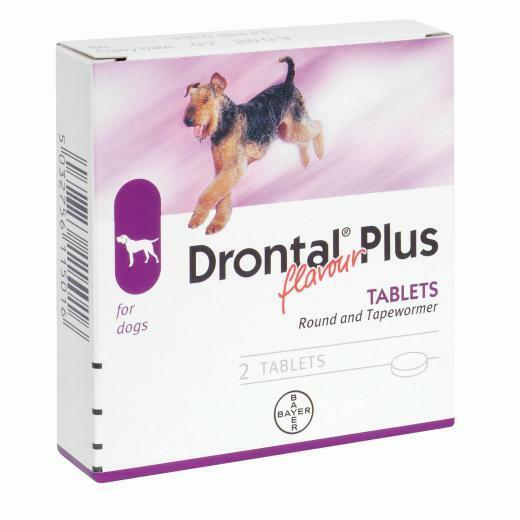 Drontal Plus Round and Tapewormer prevents gastrointestinal worms: roundworm, hookworm, whipworm and tapeworm (including hydatid tapeworm). This purchase comes with 1 tablet unpackaged, good for one treatment for a dog up to 10kg (buy multiple tablets if your dog is over 10kg, e.g 2 tabs for 20kg). This is a deworming product used as a single dose, not just a preventative that you apply monthly. So grab your pup a treat and watch his tail wag while you smile at the knowledge that you’re keeping the family pet safe as well as happy. Does this product contain 1 tablet or 2 tablets? "1 dose" in the product in your description but "2 tablets" in the picture of product. I'm very confused. This product is a 1 tablet dose. there is 2 chew in a package and my dog is 3kg should i give 1 chew every month? Yes, if your dog is 3 kg. 1 chew a month will be the correct dose. my dog is around 2kg still i need to give 1 dose? Yes, If your dog under 10 kg, you should give him/her 1 dose. How many products are in one tablet? 1 tablet = 1 dose. It is effective for a month. Pakette 1 tablet (10 kg için) var. Yani köpeğiniz 20 kg ise 2 tane vermeniz gerekir. If I buy Drontal Plus at pharmacy, it is over $20 per 1 tablet. I am very satisfied with the price and quick delivery. great costumer service and very happy with the products...thank you so much!